British commercial vehicle manufacturing falls -4.7% in June 2017 with 7,324 CVs built last month. Production in first six months declines -8.1% to 43,782 units. Exports rise for first half of 2017, up 11.9% with 27,818 UK-built CVs sold internationally. British commercial vehicle manufacturing declined -4.7% to 7,324 units in June 2017, according to figures released today by the Society of Motor Manufacturers and Traders (SMMT). Year-to-date figures also fell, down -8.1% to 43,782. Exports drove the sector, up 9.6% in June and 11.9% in the year-to-date. 27,818 of the vans, trucks, buses and coaches built in the UK so far this year have been exported, bolstered by a strong European market.1 63.5% of all production in 2017 has been for overseas demand Ã¢ÂÂ the highest level in seven years.2 This rise couldnÃ¢ÂÂt offset the ease in domestic production, which fell -29.9% in the first six months of the year following two years of very strong growth in the UK market. While domestic demand eased following years of significant growth, these figures demonstrate the importance of exports to commercial vehicle manufacturing. With such high levels destined for overseas markets, the vast majority going to Europe, maintaining competitive trading conditions with our most significant partner will be vital in order to future-proof the success of the sector. 1. The European CV market rose 4.2% Jan-Jun 2017, ACEA. 2. 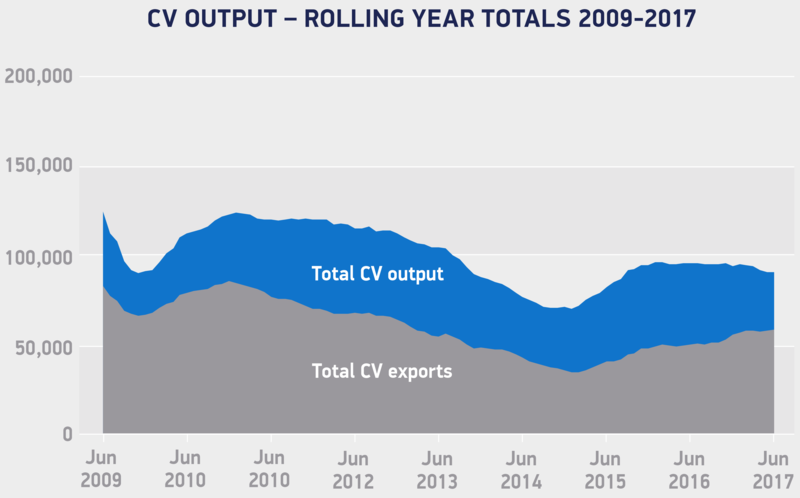 Jan-Jun 2010 69.7% of British-built CVs were exported.